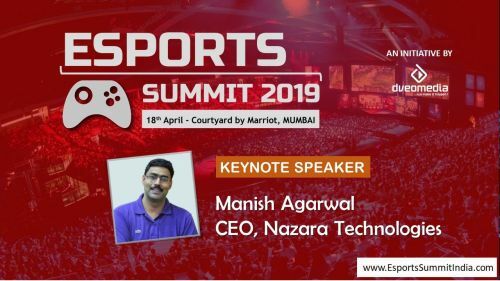 "Esports Summit 2019 (Mumbai)" happening on 18th April 2019 at Courtyard by Marriott, Mumbai. A Dveo Media initiative. The summit will be welcoming over 25 Executive Speakers from gaming, sports and entertainment industries, to provide insights on the opportunities and challenges of Esports in India and explore its future impact. The keynote speech: “From gaming to Esports and how the future is shaping up” will be delivered by Manish Agarwal, CEO, Nazara Technologies. The speakers line up in the panels discussions is as follows: The growth drivers of the gaming industry in India: Sharan Tulsiani - Business Development Manager - Google Play ; Vinit Karnik – Business Head, Entertainments Sports & Live Events – GroupM; Ninad Chhaya – COO, WITS Interactive; Arun Mozhi Varman - Head of Esport – Skyesports; Lokesh Suji – Director, Esports Federation of India. Leveraging the growing importance of Esports in global markets: Ashwin Haryani - Co Founder – GamingMonk; Anurag Khurana - Head of Esports - Reliance Jio Infocom; Devesh Kabdwal - Vice President Media and Marketing - Cobx Gaming; Dr Rushinder Sinha - Founder Global Esports; Robert Kalbarczyk, COO Kinguin Lancom Esports Venues Investing in Esports: Why and how? : Manish Agarwal - CEO - Nazara Technologies; Sidharth Kedia - Head - Strategy & Data Sciences, Viacom18; Mujahid Rupani – CEO Cobx Gaming; Shashank Randev - Angel Investor-Advisor Yuvin Sports; Robert Kalbarczyk, COO Kinguin Lancom Esports Venues. Can Esports impact on the organisation and broadcast of key sports events? Uday Sodhi - Business Head Digital Business - Sony Pictures Networks India; John McRae - MD, VADR Media, Founder, LPL, VP New Zealand Esports Federation; Raman Kalra – Partner, Leader – Entertainment, Media & Sports Advisory – PWC Optimizing on marketing, merchandising & advertising opportunities of Esports: Piyush ChoudharyDirector of Sales, Indian Subcontinent at Sportradar; Anurag Khurana - Head of Esports - Reliance Jio Infocom; Pranab Punj - Chief marketing Officer - Kinsane Entertainment; Ashwin Haryani – Co Founder - Gaming Monk; Raman Kalra – Partner, Leader – Entertainment, Media & Sports Advisory – PWC. Managing video gaming addiction: Sonali Patankar - Founder - Ahaan Foundation; Aparna Shanker - Parent of Esports Athlete/ Esports Business Owner; Ninad Chhaya - COO - WITS Interactive, Reuben Pereira – Business Development Manager/ World No5 ranking FIFA WCG 2008 Young, highly skilled Esports Athletes and ready to make it big: Kartikeya Behl - Competitive FIFA Player; Sharang Naicker - Founder Yuvin Esports; Apollonia Hannah Hinds - Founder Girlaxy India; Varun Bhavnani – Director/Chief Gaming Officer - Entity Gaming; Nirav Bakshi - Founder- Skyline Legal The panels will be moderated by Deepak Ramsurrun, CEO, Dveo Media; Ninad Chhaya – COO, WITS Interactive, Soumini Sridhara Paul, VP Hungama (Artist Aloud/Hungama Kids), Kushal Sanghvi, Vice Chairman iCom Global India and Lokesh Suji, Director ESFI. Two key partner presentations at the summit will be firstly “Esports Infrastructure - Centresto prepare teams & building the Esports arena” by Robert Kalbarczyk, COO Kinguin Lancom Esports Venues and secondly a presentation on Akamai Solutions by Vijay Kolli, Head of Mobile Strategy, Asia Pacific and Japan, Akamai Technologies. Deepak Ramsurrun, CEO and Director of Events of Dveo Media, said “We are honored to welcome Manish Agarwal, CEO. Nazara Technologies as Keynote Speaker, and the new speakers who joined recently Mujahid Rupani – CEO Cobx Gaming, Vinit Karnik – Business Head – Entertainments Sports & Live Events; Devesh Kabdwal - Vice President Media and Marketing - Cobx Gaming and Sonali Patankar – Founder, Ahaan Foundation among others. Esports Summit 2019 (Mumbai) will no doubt be an exciting opportunity to learn more about Esports and its future” The partners for the event include: Akamai Technologies, Limelight Networks, Esports Federation of India, GoPhygital, Media & Entertainment Association of India, Pepperspray Studios. The media partners are Sportskeeda, Republic TV, Spieltimes and IWM Buzz.